Minecraft review: "A big, beautiful welcome mat to the front door of your imagination"
This week, Mojang has officially begun to roll out its Better Together update for Minecraft, which unifies the console, mobile and Windows 10 versions of the game into “one lovely shiny edition of Minecraft”, complete with cross-platform play, infinite worlds, dedicated servers, and 4K HDR graphics. It’s the biggest update in Minecraft history, so what better time to return to the game that single-handedly popularized the survival-crafting genre, and offer our definitive verdict with a brand, spanking new review? Minecraft today is an entirely different beast to what it was when starting out as the twee, developmental, one-person show of 2009. Ever since those nostalgic early days of grassroots Minecraft, where its genius was evangelised via word of mouth across school playgrounds around the world, the IP has accrued billions of dollars worth of capital, generated a global following of passionate devotees, been bought out by an industry titan, and spawned the basis for spin-off games, Hollywood movies, endless crates of merchandise, and the successful careers of several noted YouTubers. Even now, it’s cultural reach has shown no sign of slowing down; travel to almost any part of the world, and there’s a good chance you’ll still be able to spot a young ‘un wearing a creeper t-shirt. This explosion of success after success has been as much of a blessing to Minecraft as it has been a source of confusion, as its expansion to almost every platform under the sun creates a point of entry dilemma for a Minecraft first-timer. There’s Education Edition Minecraft, Virtual Reality Minecraft, Pocket Edition Minecraft for mobile or Pocket Edition Minecraft for console, two different PC versions of Minecraft, Nintendo 3DS Edition Minecraft, and even Minecraft: Story Mode, not to mention all the various updates, add-ons and modded editions that have been released unevenly over the game’s eight year history. This immediately creates questions for the uninitiated. So Minecraft: Pocket Edition is technically the same as that on consoles and Windows 10, but with variant distinctions in features, gameplay and performance? And Windows 10 Edition is also on PC, but poses both discrete advantages and disadvantages compared to the original Java version? And the most updated version, 1.12.2, is available through Java on PC, but if I want those exclusive Nintendo-themed digital goodies I’ll have to go to the recently released Switch version? Hang on, which platforms include Minecraft Realms again, and why are there two versions of it!?! It’s like navigating a minefield. Luckily, the Better Together update, which released this week, is the first rung on the ladder in Mojang’s mission to simplify and streamline the Minecraft experience, bringing the Bedrock version of the game (the engine used for mobile, console, and Windows 10) into one, standardized, cross-platform product. There are still complications here of course, with no word yet on a PS4 update and the confusing existence an “old” and “new” version of Minecraft for previous owners of the console game, but it’s still a step in the right direction. The advantages of this cross-platform convergence go beyond the admittedly novel idea of a Nintendo Switch player fighting zombies alongside an Xbox One player, too, as user’s worlds and progress can now carry over to be enjoyed across multiple systems. For a game that has its roots in the rewarding investments of making something your own, this is a much appreciated feature that long-term players will surely be able to put to good use. Better Together also provides a firm solution to one of Minecraft’s long-running flaws; instantly accessible multiplayer. Joining online worlds previously required conducting some internet research to find the server that worked for you before inputting that IP address into your game, but Mojang has finally brought featured servers to Minecraft, allowing players to instantly jump into multiplayer without any of that meta-game hassle. Better Together has been lauded as the biggest update to the game yet, so it’s encouraging to learn that it’s also one of the best. Previously, the Vita and mobile editions of Minecraft presented the only two viable avenues for crafting on the go, but the technical and practical limitations of the consoles they were being played on made them the least ideal platform for play at the time. Thank goodness, then, for the Nintendo Switch, which allows high-fidelity Minecraft to be enjoyed either at home or literally anywhere else with intuitive control options, even supporting local split-screen play while on the fly. 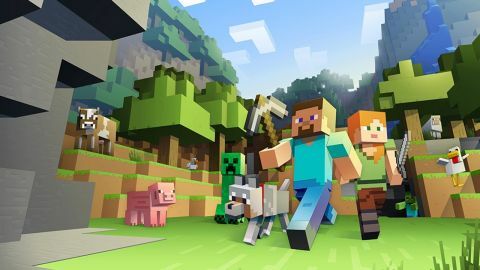 That blend of both portable utility and gameplay comfort makes Minecraft on the Switch one of the best places to play it, and this enhanced travel-handy value has done wonders for renewing the game’s original appeal all over again, which is quite the accomplishment for a console that’s been out for less than a year. While Better Together has been delayed for the Switch until later on into 2017, even in its current state it still represents the definitive portable Minecraft experience. Switch isn’t the best place to play Minecraft, however, as that crown still belongs to what has always been the game’s home; the Java version on PC. This is undiluted Minecraft without any constraints, rife with opportunity and cared for by one of the most active gaming communities out there. Even though Java Minecraft has now been left to do its own thing in this Better Together age (as that update only affects the Windows 10 Edition on PC), the wealth of mods, add-ons and community-run servers allows the original version of the game to be played in thousands of different ways and forms. Thanks to its long-running and continually thriving community, you can do things in Minecraft: Java Edition that no-one ever even imagined for the game eight years ago, from building fully operating nuclear power plants, to diving deep into RPG-like campaigns, or just setting fire to the world with a Nyan Cat themed tornado, if that’s your thing. The one downside? The integrated server client brought in with update 1.3 means that Java Edition is always online, so there remains some very slight but still noticeable lag at all times, even when playing by yourself on a high end PC. All this praise for Minecraft on Java isn’t to say that the Pocket Edition and its subsequent ports to console and Windows 10 are poor, as Bedrock has improved massively since first releasing for IOS and Android in 2011, with Better Together acting as the most recent and convincing proof to that claim. As one of the cheapest and most accessible means of playing Minecraft, Pocket Edition on mobile, in particular, has been a perfect jumping in point for those new to its world of blocks and building. Windows 10 Edition, on the other hand, has never been a fan favourite amongst the PC crowd, and you can understand why Java is preferred (sore limitations on mods being the main sticking point), but the game’s smoother performance and unique gameplay quirks aren’t without merit. As with all the other Bedrock versions, too, the impact of Better Together has also made Windows 10 Edition an immediately more attractive option than it was before, now that cross-platform play and third-party servers are available. Microsoft’s 2014 acquisition of Minecraft, for all its two and a half billion dollar sized buzz, has been an unquestionable blessing for the IP, allowing jaded creator Notch to part ways with his brainchild to let Mojang reinvigorate its passion for the franchise with an influx of new staff, new resources, and the support of a brand new partner. The results of this acquisition has brought Minecraft ever further into the forefront of mainstream gaming, with the implementation of new projects and ideas designed to make the game a safer, smoother and more servicing experience. Take Minecraft Realms; a subscription service which allows users to create dedicated, private, and always-online servers to share and enjoy with any invited friends. To some, this might be seen as a cynical cash-grab to commodify a staple of the Minecraft experience, albeit one that’s been trickier to set up than it ever should’ve been. However, considering that the majority of Minecraft’s playerbase are youngsters, Realms instead comes across to me as an admirable, smart idea that allows friends to play together in a safe environment, isolated off from the more caustic elements of the community. Even the incorporation of features as seemingly rudimentary as mini games and a community marketplace are indicative of these ongoing efforts to keep Minecraft players active and engaged outside of the core Java community, and Better Together has now duly expanded both of these features into something well beyond their proof of concept origins. Education Edition, too, is Mojang and Microsoft’s way of recognizing the game’s power as a learning tool, having been used in schools and teaching environments for years before such a version was even in the works. With educational institutions around the world finally starting to recognise the ever increasing importance of coding and computer science as taught skillsets, Education Edition has been the perfect entry point for teaching the basics of computing 101 to children from an early age, and the real-world impact of the platform has already made itself evident only one year on from its release. And yet, throughout all the evolutions and transformations, it’s still the simple pleasures of Minecraft that I treasure the most, and the euphoria of its core essence has thankfully not been forgotten by Mojang along the way. The smart economy of its visual style, the therapeutic qualities of its minimalist piano compositions, and, of course, the simple beauty of its design philosophy. Famed anglo-developer Jeff Minter once said that you can effectively sum up Minecraft using five words: “Lego, but in video games.” He couldn’t be more on the mark. Minecraft became “something” in the first place by simply letting its players make “something” out of it. It has always been the perfect canvas for letting anyone engage with their artistic side; instantly accessible but intelligently catered to advanced experimentation - this is what makes Minecraft the timeless classic that it is. Human creativity is a universal trait, after all, which makes Minecraft nothing less than a big, beautiful “Welcome” mat to the front door of your imagination.